Danny Cipriani says Sale's home fixture with Harlequins on Friday is crucial to both teams' hopes of finishing inside the Premiership's top four. The Sharks are fifth in the table, four points behind Bath, with sixth-placed Quins a further two points back. "Bath are holding that position at the moment and it's more theirs to lose," the fly-half told BBC Radio Manchester. "If there's any chance for either of us to get into the top four, this is a must-win," added the 26-year-old. "We've experienced pressure of a different level, which is to do with relegation [after battling the drop for much of last season]. "That's far greater than any pressure that comes with the top four so we're pretty equipped for this Friday." After the visit of Harlequins, Sale's remaining fixtures are against Exeter, Leicester and London Irish. 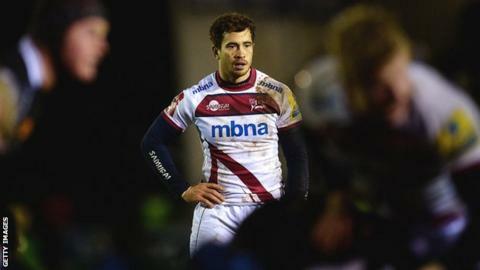 Cipriani was named the Premiership's Player of the Month for March after helping Steve Diamond's side to victories over Wasps, Northampton and Bath. The England international pipped Sale team-mate Dan Braid, Leicester forward Ed Slater and Worcester full-back Chris Pennell to the prize. "It shows how far we've come to have two players nominated," added Cipriani. "Dan [Braid] has been phenomenal all season. "From the first game, as a squad we've had a very consistent season and it's very important that people are getting awards for that. Hopefully next month there will be some others in the mix."